Although I have written previously that the United States should retain the wartime OPCON (Operational Control) for the sake of flexible strategic responses against the DPRK, it appears unlikely that the joint decision between the United States and the ROK to transfer the OPCON to the ROK military will be reversed. So how can the U.S.-ROK naval forces successfully adapt to the change? Answering this question necessitates that we first examine the existing ROK naval capabilities. To the extent that the ROK Navy’s (ROKN) capabilities warrant our attention, it can be argued that this is due to the ROK’s recent military build-up. It should also be noted that the ROK’s naval might can be seen as a reflection of its commercial interests abroad. Indeed, Terrence Roehrig avers that the ROKN’s blue-water capabilities, as seen in its commitment to the ongoing counter-piracy campaigns in the Gulf of Aden, might suggest a link between and its naval might and the ROK’s need to protect its commercial interests and its international standing as a middle power. While there may be some truth to his argument, a more plausible explanation might be that naval power still remains “the best possible means of ensuring the region’s safety without triggering any further escalation.” After all, the ROKN has more than proved its mettle during limited naval skirmishes in the late 1990s and early 2000s over the contested Northern Limit Line (NLL). It is not surprising, therefore, that the ROKN remains the most battle-hardened of the four ROK armed service branches. Nonetheless, the ROKN still has a long way to go before it establishes itself as a truly independent armed service. As the sinking of the corvette Ch’ŏnan and the shelling of Yŏnp’yŏng in 2010 suggest, the ROKN still lacks the ability to conduct anti-submarine warfare (ASW) and to successfully counter DPRK’s asymmetric threats. The ROKN’s operational shortcomings are particularly troubling in that they were highlighted by the Korean People’s Army Navy, suffering its own limited operability due to its aging fleet and lack of unity within its command structure. However, as my January piece for the Georgetown Journal of International Affairs and Michael Raska’s East Asia Forum article argue, the greatest barriers to service excellence for the ROKN may be South Korea’s uneven defense spending, and operational and institutional handicaps within the conservative ROK officer corps. Because the ROK Armed Forces remains Army-centric, whereby its command structure and logistics fall under the control of the Chairman of the Joint Chiefs of Staff (ROK CJCS), who has always been an Army general, the ROKN has yet to achieve autonomy as a truly independent service within the existing arrangement. Such barriers do not bode well for the ROK’s most battle-hardened service branch because it ultimately stymies much-needed flexibility and creativity. In light of both Kim Jŏng-ŭn’s constant threats and the newly proposed Combined Forces Command structure, readjustments at both operational and strategic levels may be required for the U.S.-ROK naval forces to successfully deter further acts of aggression by Kim Jŏng-ŭn. One such readjustment, given ROKN’s weaknesses in its ASW capabilities and counter-asymmetric warfare, would be to redirect ROKN’s focus away from its blue-water ambitions to bolster its coastal defense capabilities. But doing so would jeopardize ROK’s maritime interests abroad and would foster the uneven growth of ROKN by encouraging uneven emphasis on one naval element at the expense of another. Phase 1: A PHOTOEX; Phase 2: The World! Instead, a more pragmatic alternative would be for South Korea and the United States, together with Japan, to establish a combined fleet. 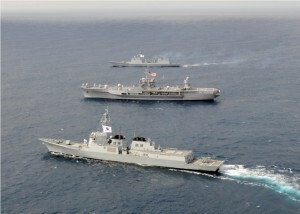 While it is true that South Korea and Japan remain at odds over historical grievances and the territorial row over Dokdo/Takeshima, given that the three navies frequently interact through joint exercises, such as RIMPAC, and other exchange programs, so the creation of such fleet in the face of a common threat should not be ruled out. Under this arrangement, each navy would buttress inter-operability by sharing its unique resources and culture with each other. Indeed, the proposed combined fleet would enable ROKN admirals to effectively exercise wartime command over their own fleets, while at the same time help them learn from their sister navies [see note below]. Even more important for the United States, given that “the U.S. operation within the Korean Peninsula is likely to remain a peacekeeping one,” such arrangement would “ensure that [the United States Navy’s] presence is seen and not necessarily felt.” Last but not least, the proposed combined fleet could serve as a quick reaction force in the event of unforeseen crises. Ultimately, in order for the U.S.-ROK naval forces to effectively counter the threats posed by the DPRK, the ROK Armed Forces itself must undergo a radical transformation. Doing so necessitates that it gradually move away from its Army-centric culture to accommodate jointness among the four services. It must also come up with a coherent budget to sustain its capabilities. In short, the 2015 wartime OPCON transfer may pose challenges for the U.S.-ROK naval forces to successfully counter and deter future provocations by Kim Jŏng-ŭn. Nevertheless, it also presents an opportunity for those who would seize it. Perhaps this evolution in the extant U.S.-ROK alliance may allow the ROKN to truly come of age as an independent fighting service. Jeong Lee is a freelance international security blogger living in Pusan, South Korea and is also a Contributing Analyst for Wikistrat’s Asia-Pacific Desk. Lee’s writings have appeared on American Livewire, East Asia Forum, the Georgetown Journal of International Affairs, and the World Outline. 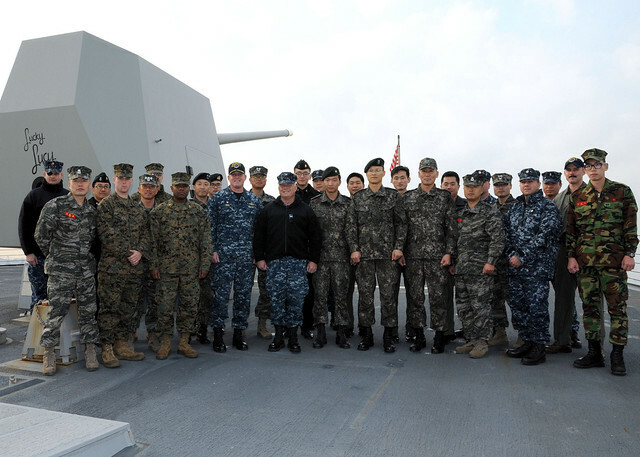 Note: In a subsequent blog entry, I will explore ways in which the US-ROK Navies, together with the Japanese Maritime Self-Defense Force (JMSDF), can best optimize their capabilities within the aforementioned combined fleet structure. There has been one exception to this rule. In 1993, Kim Young-sam appointed an Air Force general to serve as CJCS. However, after much resistance from the Army officer corps, no general or admiral from any other service has served as ROK CJCS since 1994. While the S. Korean and Japanese Navies might work together under a US Commander, I don’t see the Japanese cooperating under a S. Korean flag officer. More combined fleet means more flexible and cooperative unite. May be more trust.This is what is necessary now. Nor would ROKN admirals want to place themselves under their Japanese counterparts. On that point, I agree. However, there comes a point where they have to set aside historical grievances to deal with a common threat. However, as VADM Koda of JMSDF argued in his paper for the Naval War College, both navies are already starting to develop a solid rapport. A combined fleet is in concept an interesting idea, but the devil would be in the details. As Chuck Hill points out the issue of command would be a very tricky one not easily overcome, but there might be flexible models to be found in the recent HOA counter-piracy experiences. Looking forward to your thoughts on the form in the next post. There would also be issues involving equipment compatibility–ROKN equipment has a long way to go–logistics, not to mention language barriers. But many of these issues have been overcome through exchange programs and joint exercises. All right. I will no doubt flesh these out in more detail by next Sunday the 30th DC time. One possible way that the two fleets (JMSDF & ROKN) can achieve future interoperatability is for their forces in the next round of procurements move towards the NATO standard, if they haven’t already (which the RAN has done (if my memory serves me)). This way they are interopertable with the USN which is already meeting that standard, and other navies that meet that standard as well. Perhaps a regular rotation schedule among the three navies, with the prospective commander serving as deputy for a time before assuming command. Pingback: Has South Korea Lost the East Asian Stealth Race? Pingback: Can South Korea's Military Successfully Reorient Its Strategic Priorities?